Center files legal action against private dock being built at Cumberland Island National Seashore. Center sues Glynn County for violating due process in allowing controversial Sea Island project. And Keep web-searching for Center commentary on important coastal Georgia issues. 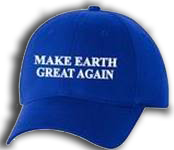 Get a "Make Earth Great Again" ball-cap when donating to the Center. This washed denim cap is a very popular item, with over 400 now in circulation. We suggest making your donation online using Facebook and sending us a note confirming it by email (susdev@gate.net) so we can mail you a MEGA ball-cap. OR send a check for $30 or more for Center membership to our office (address below). OR select the Donate tab below on the left side of this page and use your credit card. Your support is essential to coastal protection by the Center. Please join other thoughtful individuals, families and businesses - make a tax deductible contribution! The Center's event, "Climate Change and the Future of Coastal Georgia" featured in a recent news story. Center comments on risks of toxic pollution caused by LCP site. Center disputes claims for $700 million Savannah port project.